Welcome to the Tullimba web page. Located 40 kms south west of Armidale, NSW, Tullimba is a world-class feedlot research facility designed to provide research and training opportunities to enhance the international competitiveness of the Australian beef industry. 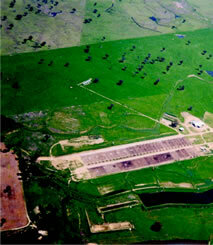 The property itself is approximately 740 hectares in area, while the feedlot is licensed to carry 1000-head. The feedlot was established in 1994, one year after the property was purchased by the University of New England. Tullimba feedlot was purpose built for the Beef Cooperative Research Centre (Beef CRC) principally through a $2 million grant from the NSW Cattle Compensation Fund. Individual feed intake recorders fitted to feed pens allow research data on an individual animal's performance and feed intake to be collected. The property's significant irrigation areas allow fodder to be utilised by the feedlot. Tullimba promotes greater cooperation between geneticists, nutritionists and meat scientists, and is designed to provide reliable and rigorous research data to maximize industry confidence and use of information flowing from the facility. Besides the valuable contribution to research, Tullimba is also available for commercial feeding arrangements. It has significant industry support and is regularly utilised by breed associations for contract research.